In prison, where everyone wears the same clothes, and inmates are more like statistics than people, individuals get overlooked. And in Litchfield, it’s not just the people that get overlooked, it’s their problems, too. The company touring Litchfield to decide if they want to acquire the prison treated the women as nothing more than animals that might cost too much to keep around the house. They sneered at the cost of women’s “health requirements,” and the fact that women tend to eat less than men was lauded for keeping costs down. It was not the best day to show off Litchfield on a tour. Partly because the inmates are still sleeping without any mattresses or pillows, partly because the women’s periods all synced up, and partly because the inmates are all dealing with various losses. Bennett has been missing for two episodes, which is two weeks in prison-time, and Daya is starting to lose it and take it out on the breakfast eggs. Red and Morello are falling apart after Nicky left — Morello is without lipstick, so you know it’s serious. (That might sound sarcastic, but it’s not.) Suzanne and Taystee are both still processing losing Vee, and in a touching scene, they turn only to each other to mourn the monster that they truly miss. Alex is still struggling with losing the life outside of prison that was just ripped back out of her hands, and she turns to Piper for comfort. But Piper is on her period like everyone else, and on top of that it’s “June 7th” aka her 32nd birthday. The only people who seem to be doing well this episode are Big Boo and Pennsatucky, two unlikely friends who I’m very much enjoying. Boo doesn’t seem to be missing Nicky at all, and she bounces back by forming a plan with Pennsatucky to take advantage of the religious extremists sending her money in prison. Boo gets a makeover from Sophia and Morello to look more ladylike so she can act as a reformed lesbian to impress the church, which connects to her flashbacks where her parents wanted her to look “normal” instead of butch. To feel invisible is one of the cruelest emotions. That’s why Vee had such an impact on Suanne — Vee saw that she had value, even if Suzanne’s value to Vee was just to be used in her power ploys. Boo’s parents made her feel invisible her whole life and never accepted that she was different and unique. Boo’s speech to her father in the hospital was touching and so well done. “I refuse to be invisible,” Boo said, and she meant it. She fought every day to be seen and to be herself, and she can’t go through her plan to scam the church if it means covering up who she really is. Sometimes the most powerful thing you can do is not apologize for taking up space and let yourself be seen. Boo’s struggle with saying goodbye to her mother fits right in with this season’s theme of motherhood. Red is Nicky’s mother figure, and Red feels like she has lost her own child after Nicky was taken away to max. Taystee and Suzanne both looked up to Vee like a mother, and they are reeling from losing that figure, even if it wasn’t a healthy relationship. Daya is about to become a mother, and the one person she was counting on to help her through this just disappeared without a word. Now all that’s left for Daya might be her actual mother, and she doesn’t seem like the best source of help and compassion. Inmate of the episode is definitely Pennsatucky, the wisest schmuck at Litchfield. Thank God Boo got her to brush her teeth. WHAT is going on with this flirtation between Healy and Red? I for real cannot deal with it. That guy Danny with the clipboard that Caputo kept talking down to is definitely in charge of the whole company, right? 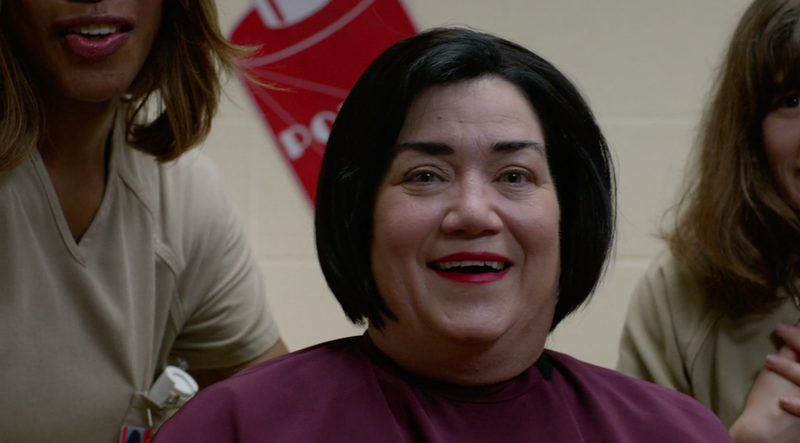 How funny was Maritza questioning if Bennett slept with Aleida?